The Green Lung – An Oasis Nestled in The Heart of Bangkok! It’s been said that Bangkok is a city that never sleeps. Living among the high rises, shopping malls, and bustling markets is exciting. It may come as a surprise to realise that hidden just a short distance away from this hive of activity is a real oasis of tranquility and greenery. Phra Prapadaeng, also known as Bangkok’s “Green Lungs,” is an area protected from commercial development. Nestled in the horseshoe of the Chao Phraya River, the Green Lung is a lush oasis in the heart of the city. 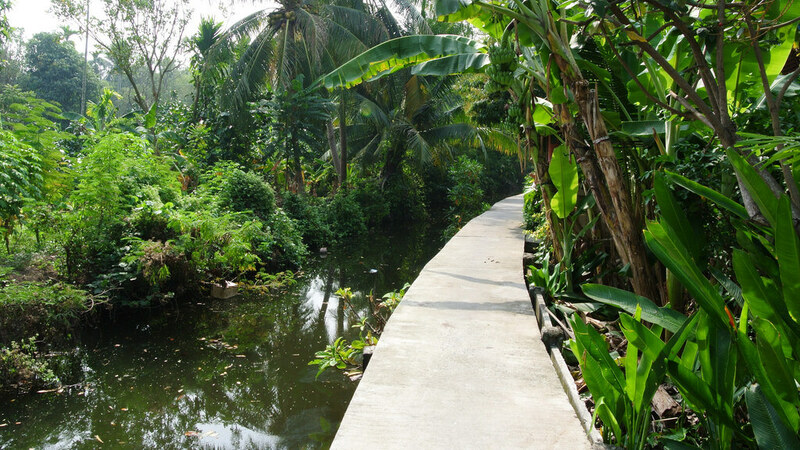 This small jungle is home to several villages, bike rentals, walking trails, and more. To visit Phra Prapadaeng, you’ll need to take a boat across the river to Bang Krachao. You can catch a boat from the city at the Wat Klong Toey pier, for a fare of just 20 baht. From there, you could hail a motorbike taxi to explore the area. But the most popular form of transit for visitors are bicycles, which can be rented for around 50 baht for a half day or 100 baht for a full day. There’s plenty to see during your visit, but if you plan to navigate the area by bike, be careful. Riding a bike in Phra Prapadaeng does take a bit of skill. Many of the roads and walkways are elevated, because much of the area is a marsh and is prone to flooding. Some of these walkways do not have railings, so you’ll have to be able to balance on a bike to stay dry. Once you’ve rented your wheels, you can begin exploring the area. About a half kilometer from the boat dock is the start of the Sri Nakhon Khuan Khan Park. This sanctuary is home to several square kilometers of untouched jungle, and is also a bird sanctuary. There are plenty of side trails and viewing areas where you can relax, take in the fresh air, and maybe catch sight of a few rare birds native to the area. One of the most popular attractions in Phra Prapadaeng is Bang Nam Pheung floating market. Open on Saturdays and Sunday, the name of this market is mostly for show. Only a few of the vendors operate on boats, and the rest are on land, but the market is still a must-see. Shop for t-shirts and homemade items, and of course, delicious Thai cuisine. Also, located in the Green Lungs is the Siamese Fighting Fish Gallery. Open on Saturdays and Sundays and free to visit, this gallery is the only of its kind in the world. Like the floating market, don’t let the name fool you. The fish here don’t fight but you will enjoy viewing tank after tank of colorful, exotic Siamese Fighting Fish. Nestled in a quiet area of the green lung is a small outdoor area where you can learn to Tie-Dye and make incense with the help of the locals. You can purchase what you’ve made. This is a great way to spend an hour or two enhancing your skills and knowledge. It also means you will have a souvenir to act as a reminder of your day spent on the green lung. For those living in Bangkok, a day in the green lung is usually exactly that – a great day out. There are also interesting places to stay if you want to spend longer there or are visiting Bangkok and want to experience something different to the norm. One interesting spot to stay and promoting a green way of living is the Bangkok Tree House.